To play music on my house audio system, I used to go to an app on my iPhone and select what I wanted. Now with the Dot connected, I simply say “Alexa, play the Rolling Stones”… and she plays it (from Pandora/Spotify/Prime). 1) “Alexa - turn the temperature to 74º” - I don’t even say please and she does it without complaining (connected to our Nest thermostats). 2) In the kitchen she keeps track of my grocery lists…“Alexa add toilet paper to my shopping list” - I just open the Amazon Alexa App on my phone and bam, the list is right there (or I can tell her to just order it and BAM, it shows up at my door the next day (shipped from Amazon Prime). 3) Sports updates - she knows the score. 4) Trivial facts (or even mathematics) - she’s reeeeally smart, and always right, so, we generally have nothing to bicker about. 5) Weather & traffic reports - she’s on it. 5) We’ll soon be adding some lighting control (with Lutron) so I can say “Alexa - give us some romantic lighting” and BAM - she gets in the mood. It’s only been a week we’ve been together but, we’re basically hitched. 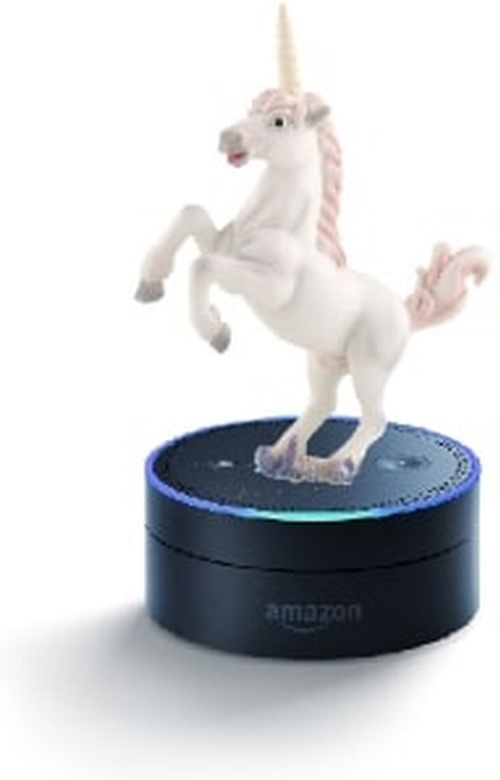 FYI if you want your own Alexa, she might play hard-to-get (close to unicorn status). Currently the only way to order the “Echo Dot” is through voice-command. You must have the OG Amazon Echo or, have a FireTV with voice-remote (along with Amazon Prime account). Click the unicorn picture above to find out more or, and I’m not the jealous type so, if you want any advice I’ll be here to help (or if you have any input on the Echo's competitor, “Google Home”, I’m all ears).